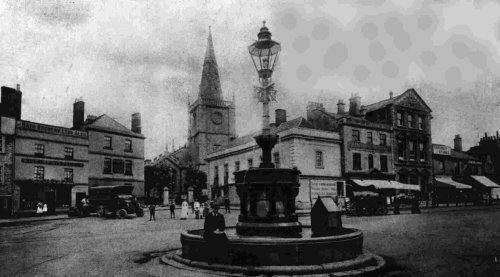 The idea of a war memorial in Chippenham was discussed at a meeting of the Town Council on the 5th September 1916. Mr Small asked if there was a record being kept of the men who had been killed. He presumed that after the war there would some memorial erected but by then it would difficult to get an accurate list of the dead. A roll of honour was being kept in the parish church. The next time the memorial was discussed was after the war, at a council meeting in January 1919. The council formed a large sub-committee to discuss the form that the memorial should take. In April 1919, the committee had decided on buying Monkton Park house and grounds and turning them over to public use as a Memorial. This was a controversial and by now means unanimous decision. A Miss Morgan said that she was in favour of a real memorial and the sacrifice of the men should not be commemorated in a pleasure ground. When the proposal was put to the full council in May 1919, it was rejected, mainly on cost grounds. The council put the design of the memorial to a public competition. Various suggestions were put forward including a pathway and lights over the Town Bridge, work men's houses with the streets named after the battles, a memorial in Bird's Marsh and the enlargement of the Cottage Hospital. But the most popular suggestions was for a memorial on which, the names of the fallen would be inscribed. The war memorial would be in the market place, a prominent position, as everyone travelling along the London Road would see it. The memorial would use the existing disused fountain. The front would have the names inscribed and the reverse would be a small fountain and drinking trough. The memorial was designed by Mr Parker-Pearson of Grittleton and would cost about £785. Finally after much wrangling and indecision, the war memorial was completed in time for the unveiling ceremony which took place on the 4th September 1921. The local paper, The Wiltshire Times covered the unveiling, the report is shown below. Sunday (4th Sept 1921) saw the consummation of efforts in connection with an undertaking and a debt of honour which the Town has had in hand for over 2 years, namely, the unveiling of the town memorial to the 160 of it’s former citizens who went forth during the war in defence of their country and did not return. 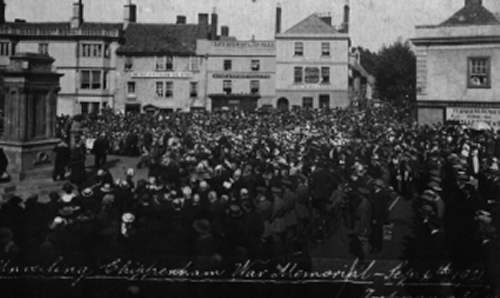 In proportion to it's population, Chippenham lost heavily in the death toll of the war and it claimed, in common with other places, men of all classes including one member of the Corporation and in two instances in the town 3 in the same family were taken. From the first there was a common desire to honour the memory of the fallen by perpetuating it in substantial form and the Corporation, who took the matter up during the mayoralty of Coun Hyatt, having by subscription, received sufficient to justify proceeding on the practical stage, invited designs for a public monument. The design accepted takes the form of a cenotaph 18 feet in height and is situated in the Market Place facing the London Road. It stands upon the site of the old drinking fountain erected in the 70's to commemorate the installation of the town's water works. This fountain in recent years had fallen into decay, and the idea of the architect was to retain the useful proportion of the same and substitute the remainder with a substantial and dignified monument. The result being is one of the best memorials in the West of England. One half of the drinking trough for cattle has been retained, and the public drinking fountain refixed at the rear of the memorial whilst suitable portions of the other half, being of granite have been incorporated in the design. The Cenotaph as seen from the London Road is approached by 4 steps and is flanked on both sides by piers and balustrades. The Cenotaph itself is of masonry with renaissance columns at each angle supporting an entablature and casque. The names of the fallen, numbering some 160 are inscribed in a recessed panel between the front columns and will form a lasting tribute to their fame. A niche is formed at the back there in is a sprinkling fountain, the water rising through a pitcher overflowing into a granite basin, then into a larger basin and finally into the cattle drinking fountain, while at the same time, water discharges at s other points connected direct to the town's water mains. The whole of the new masonry is of stone from the Hornton quarries, Oxfordshire. The durability of the stone being proved by the fact that there are memorials existing today in a good state of preservation which were erected many centuries ago. Mr G Parker-Pearson of Grittleton, is the architect responsible for the design of the memorial, which has been carried out in the same efficient and artistic manner as the other memorials that he has done. The design was one chosen by the Council from others submitted in competition and there is no doubt that Mr Parker-Pearson's particular treatment and use of the original fountain gained him the honour of his design being accepted and all alike are loud in their praise of his work. The memorial was built by Messers JF Booth and Sons of Banbury, Oxfordshire. On the day of the unveiling, the weather was good. A large number of people turned out to witness the ceremony. Prominence in the crowd was given to ex-servicemen; two of their number were invited to unveil the memorial. 175 ex-servicemen under the command of Lt Bishop and Sgt Banks marched into the square, preceded by the Salvation Army Band. Capt Booth of the building contractors and Mr Parker-Pearson were introduced to Lord Methuen. The Mayor said that they "had unveiled the Cenotaph to the memory of their Country men who went forth, endured hardship, faced danger and finally passed out of sight of men in the path of sacrifice, through the gate of death". The care of the memorial devolved upon the corporation of that borough for all time and "on whose behalf he accepted that responsibility and trust." Pte HA Drummer, late Wiltshire Regiment, who had lost a leg, laid a wreath in the form of a cross on behalf of all the ex-servicemen. There then followed a 2 minutes silence, which was broken by Buglers Harris and Drewitt sounding Reveille.